Haven McGraw takes a lead off of second base after driving in a run for Washington during a Frontier Athletic Conference game against Hillsboro Wednesday, April 3, 2019. 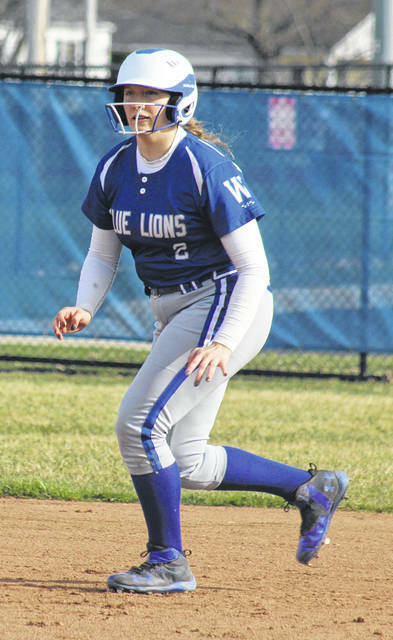 The Washington Lady Blue Lions varsity softball team was in search of its first win of the season when they hosted Hillsboro for a Frontier Athletic Conference game on a sunny and mild Wednesday afternoon. Hillsboro stormed out to a 6-0 lead, but Washington was able to allow just one more run and chipped away and kept battling until they emerged with a 9-7 victory. Mckenna Knisley was the starting and winning pitcher for Washington. She pitched seven innings, allowing eight hits and seven runs (three earned) with six strikeouts and one walk. G. Dearmon started and took the loss for Hillsboro. She pitched six innings with six hits and nine runs (seven earned) with four strikeouts and seven walks. In the second for Washington, Corynn Chrisman walked and Emma Funari walked. Haven McGraw singled, scoring Chrisman. Brooklyn Foose had a bunt single that scored Funari. An error on the play allowed McGraw to score. Brooklyn Devenport bunted into a fielder’s choice with Foose out at home. Maddy Jenkins then hit a double to score Devenport to put the score at 6-4. Hillsboro scored a run in the third to make it 7-4. Washington scored three runs in the fourth. Foose walked and Kassidy Olsson had a bunt single with Foose going to third on an error. Devenport bunted for a hit and Foose scored. The next two batters were retired before Meredith Pabst reached on an error that allowed Olsson and Devenport to score. There followed the defensive play of the game, turned in by Hillsboro center fielder Kenzie Dietrick. McGraw lifted a high fly ball to deep center. The ball kept carrying and appeared to have a chance to leave the yard. Dietrick ranged over to her right, jumped up and made a great catch with her glove clearly above the fence, robbing McGraw of a grand slam home run. Washington later gave Dietrick the ball to take home as a memento of a great play. The game remained tied, 7-7 through the sixth inning. Devenport made a fine defensive play in the top of the sixth on a grounder that appeared headed into the outfield for a hit. She ranged to her right, backhanded the ball and turned and threw the runner out. Washington also turned a double play earlier in the game. In the bottom of the sixth, with one out, Knisley walked and Mallori Tucker went in as a courtesy runner. Pabst hit a single to left that moved Tucker around to third. Chrisman hit into a fielder’s choice that scored Tucker. After stealing second, Pabst moved to third on Chrisman’s ground out. Emma Funari grounded out for the second out that scored Pabst. Hillsboro got a single and the courtesy runner advanced to second before the final out was recorded. “They had some bunts and some bloopers, you name it, the ball had eyes in the first inning for them,” Washington head coach Randy Elzey said. “It was unfortunate for us. We did have a couple of mental mistakes and a couple of errors, but, the ball was just finding holes, it didn’t get hit hard at all. “After coming home from a late night last night from Wellston, I thought we came out a little flat today,” Elzey said. “We kept challenging them to keep their heads in the game and come back one run at a time. And we were able to do that. “It was one of the better defensively-played games, especially there late,” Elzey said. “We had a young lady from Hillsboro, Dietrick, who made a great play that took a grand slam away from one of our power hitters. It was clearly over and she brought it back in. “Later in the game, our second baseman, Brooklyn Devenport, made a great defensive play,” Elzey said. “We kept strong and played some small ball tonight. “Mckenna Knisley did excellent job tonight,” Elzey said. Washington (1-4) is at Logan Elm Thursday and home to take on Chillicothe Friday at 5 p.m.
Offensively for Washington: Kassidy Olsson, 1-4, 1 run; Brooklyn Devenport, 1-3, 2 runs, 1 rbi, bb, fc; Maddy Jenkins, 1-4, 1 rbi, 2b; Makenna Knisley, 0-1; Meredith Pabst, 1-4, 1 run, roe, sb; Kassie Wiseman, 0-0; Corynn Chrisman, 0-2, 1 run, 1 rbi, bb, fc, hbp, sb; Emma Fumari, 0-2, 1 run, 1 rbi, bb, hbp; Haven McGraw, 1-4, 1 run, 1 rbi; Brooklyn Foose, 1-2, 1 run, 1 rbi, bb; Mallori Tucker, 0-0, 1 run. LOB: 8. Offensively for Hillsboro: K. Dietrick, 2-4, 1 run, sb; G. Dearmon, 1-4, 1 run; C. Page, 1-3, bb; Z. Grove, 0-0; M. Parsons, 1-4, 1 run, 1 rbi; J. Myers, 1-4, 1 run, 1 rbi, roe; K. Thornburgh, 0-3, 1 run, fc; A. Pettyjohn, 2-3, 2 runs, 2 rbi, 2b; J. Moberly, 0-3, 1 rbi, roe; E. Birkhimer, 0-3, roe; J. Williamson, 0-0. LOB: 4.